This dress is originally from the bastion of fast fashion, H&M, one of their eco-recycled-garbage (ERG) collection, but I bought it pre-loved. Of course there is a real feel-good, corporate-speak name for it but I can't be bothered to check - I like ERG. I blogged about it the first time HERE as my entry in an H&M contest, a completely different styling with an alley shoot - lots of fun. But I didn't win - my fizz was apparently too flat (or maybe too fizzy) to refill these recycled PET bottles. Judging by the women who became finalists, my contents were decidedly past their best-before date. All I can say about that is - old food can be good. Cases in point. Have you ever experienced the dry chewiness of an old marshmallow? Bliss. Or the ecstasy of eating a chocolate bar you'd lost in the glove compartment for over a year? (Question: Did anyone ever really put gloves in a glove compartment?) And what about grapes? Old grapes taste great in wine, although some of my old ones are just sour. Well, semi-sweet. 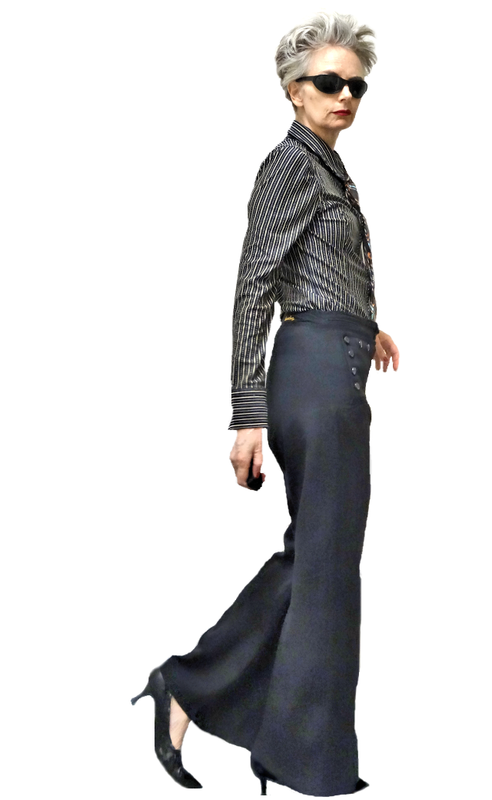 The bell bottoms are by Rip Curl, thrifted. The booties are thrifted too, not my first choice for this outfit but I needed a heel. Many of my shoes are in sick bay right now with heel ailments. Seriously, footwear should come with insurance or a Dr. "Bones" McCoy fix-it wand from Star Trek. 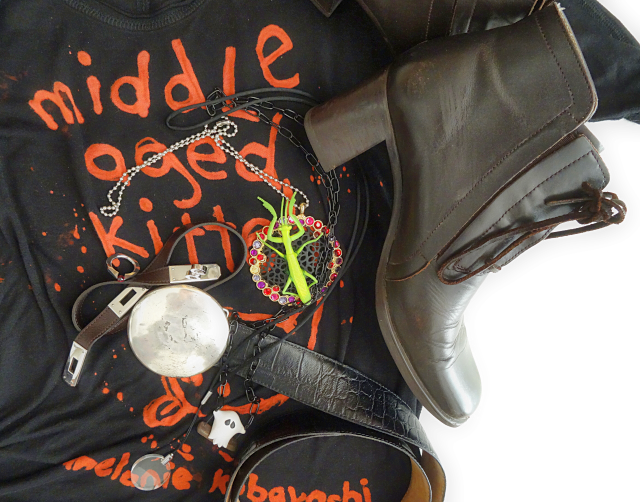 You can see all the extra stuff below: magic loupe pendant and ring by O, available HERE, handmade ghost-on-a-swing necklace by friend Monique, a hoity-toity brand leather wrist wrap (gift), leather belt with silver buckle by Josef (say it like it's French), booties, DIY T-shirt, and my favourite DIY praying mantis pendant made from an on-sale Liz Claiborne Christmas ornament. Those insects are amazing creatures. Did you know that the female often devours the male after coupling? A woman wrote the following comment in response to an article about praying mantises in Entomology Today, which I stumbled across while doing research. WARNING: This paragraph deals with the animal kingdom. Don't read it if you are squeamish. I followed a female mantis that took up eye-level residence on a pepper plant last summer near my door, and she eventually mated with at least four different males, and for several days had two on her back at the same time with more males standing around expectantly. The female nibbled an eyeball of each mate, then finished the other eyeball, then eventually ate the whole head. Each male stayed attached to her for several days, ending up as discarded wings on the surface of the flowerpot a foot below after a new male took up position. Moving right along... With a cart. 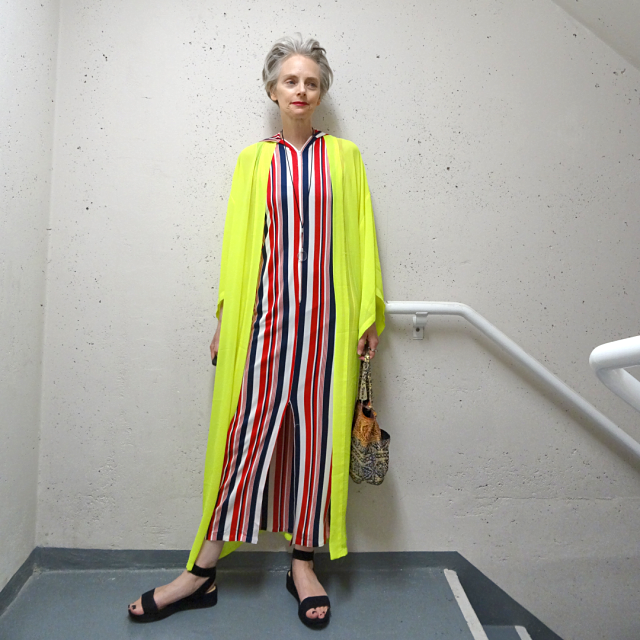 I dug this neon lemon robe and red, white, and blue hooded garment out of the alien pod vault a few days ago. Static, just hanging there, this outfit looks like almost nuthin', but in motion it flies. 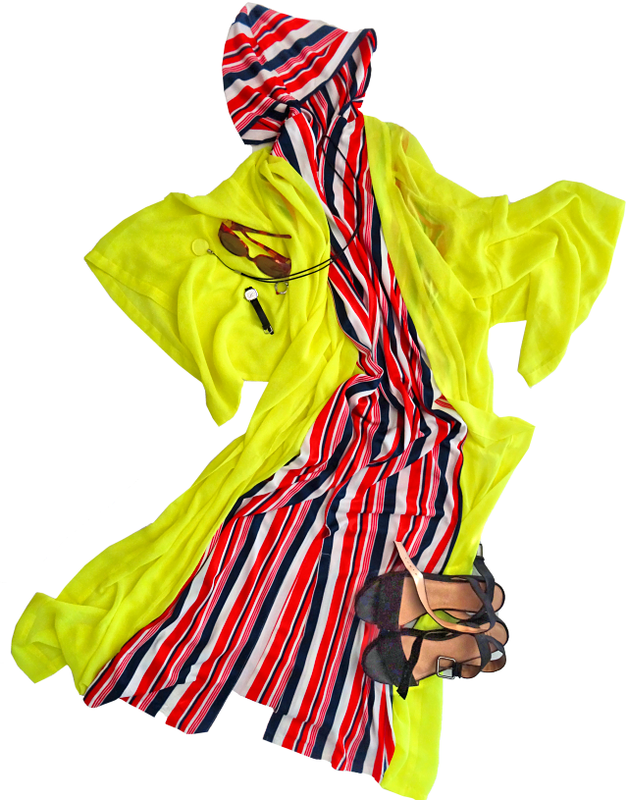 The robe gently laps at the legs of unsuspecting passersby with the slightest breezy provocation. I wasn't sued for it either. Or devoured. These weakling pixels - they just can't seem to capture this neon colour. I bumped the saturation on the photo below but it didn't help much. I got those Zara shoes out of the vault too. The dress thingy is sleeveless and has a front slit and zip. The Chanel sunglasses are also a gift. The loupe and ring, O made me. And that's a mechanical Tissot watch, which, if you've forgotten, means you have to wind it up by hand. And it has 17 jewels! It's old too. O reconditioned it and machines custom parts if it gets stuck in the past. I posted about another outfit this week on Instagram if you're interested, HERE. That's all for now. I had a wonderful meetup with some fellow bloggers this week, but that will have to wait. 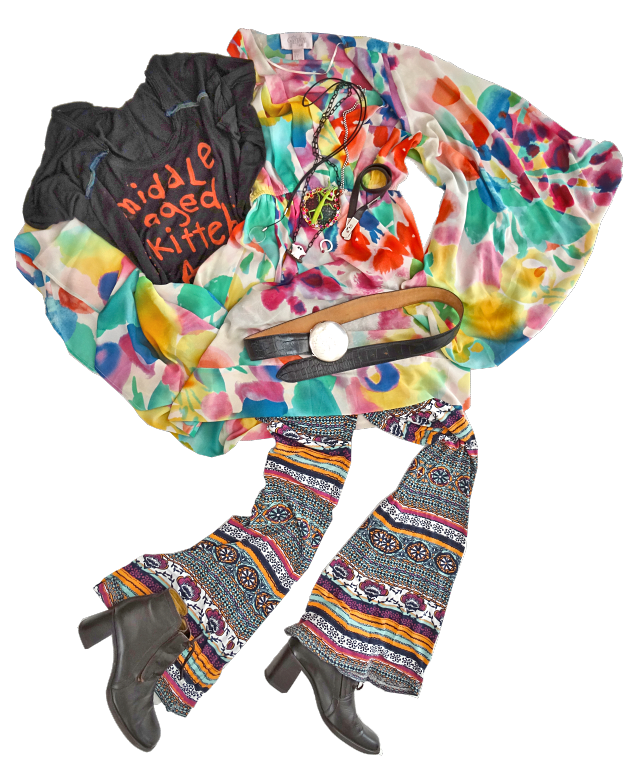 I'll link up to Visible Monday at Not Dead Yet Style, hosted by Patti, and #iwillwearwhatIlike at Not Dressed as Lamb, hosted by Catherine. See you there. I wish a company would sell old marshmallows so I don't have to age them myself. They seldom survive to old age in my home. What about marshmallow wine? 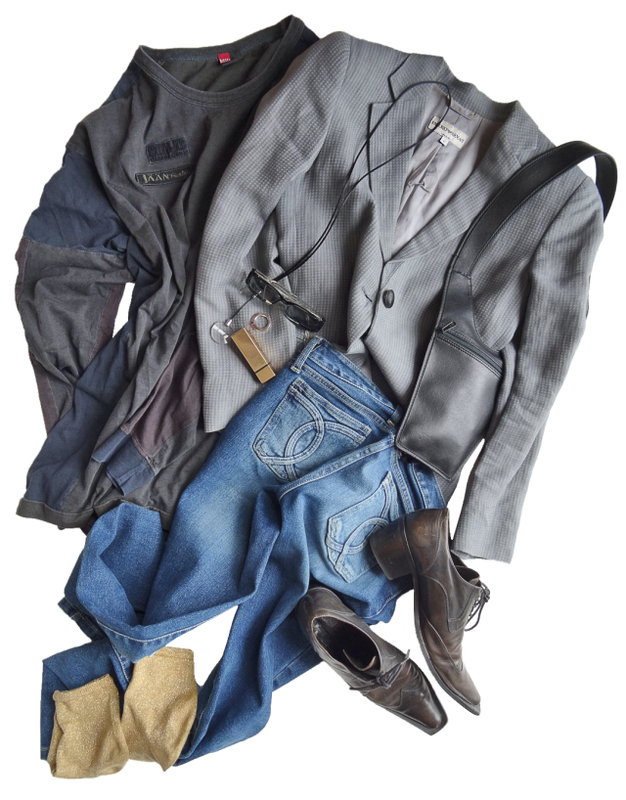 What do you wear when you want to wear something masculine/feminine, high brow/low brow? You wear this. 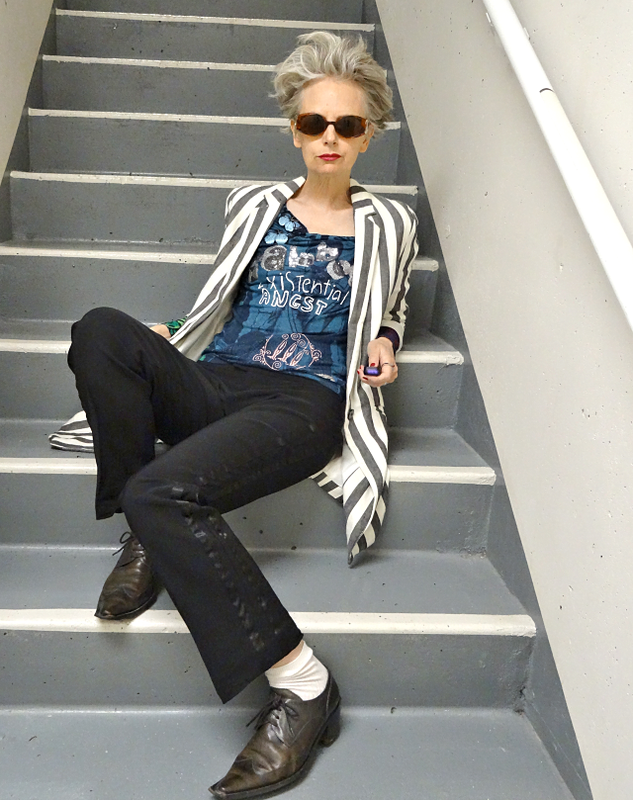 The main ingredients are my thrifted vintage Emporio Armani jacket, thrifted men's Diesel T-shirt (size Impossible with super-long sleeves), women's Bardot jeans from a sample sale, and men's thrifted narrow shoes. 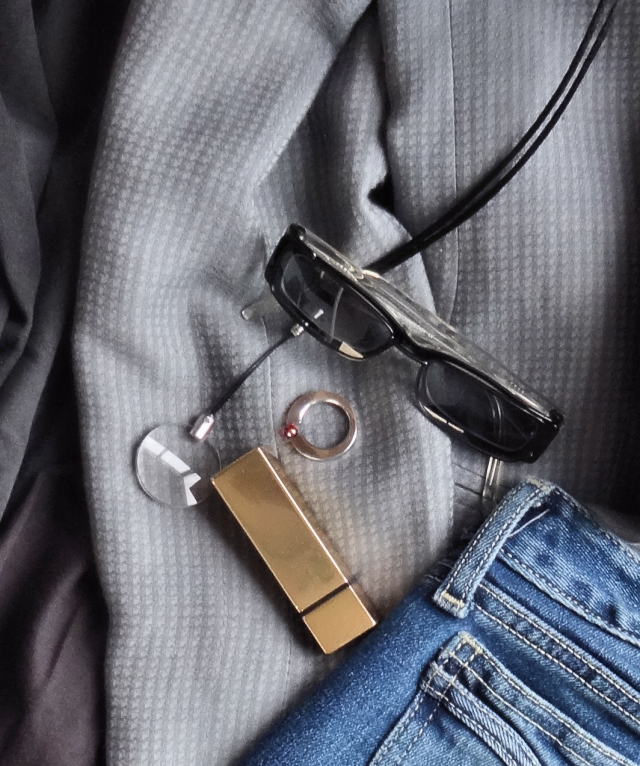 Of course, the most essential ingredients of this ensemble are my magic loupe and ring, which O made me. You can get them now too from his Etsy store, HERE. And naturally, I've thrown in my gold glitter ankle socks and favourite lipstick. I even wore my glasses because A) I love them, and B) the cool clip-ons make them so baaaad (say it like a sheep, should be shoop, heck, just say it like a goat). But to add to the feminine side I did this, below. 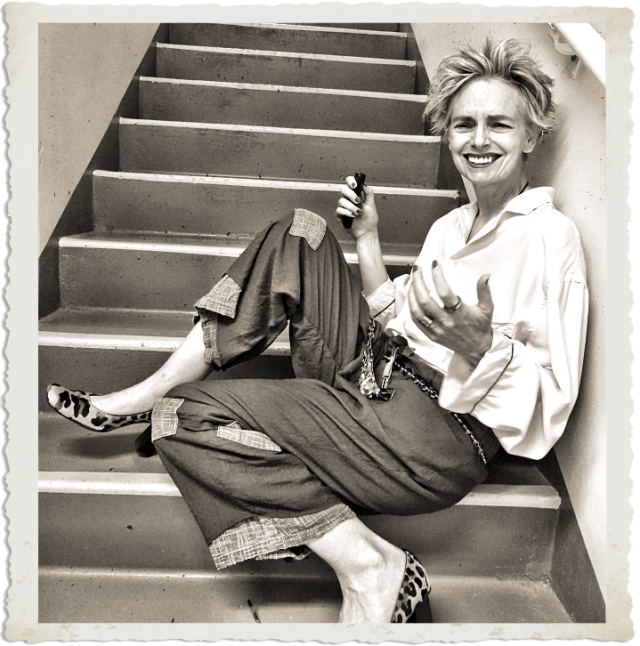 I wore O's little leather pouch - I think it's designed for carrying gems!? Anyway, I swiped it. Hahaha. 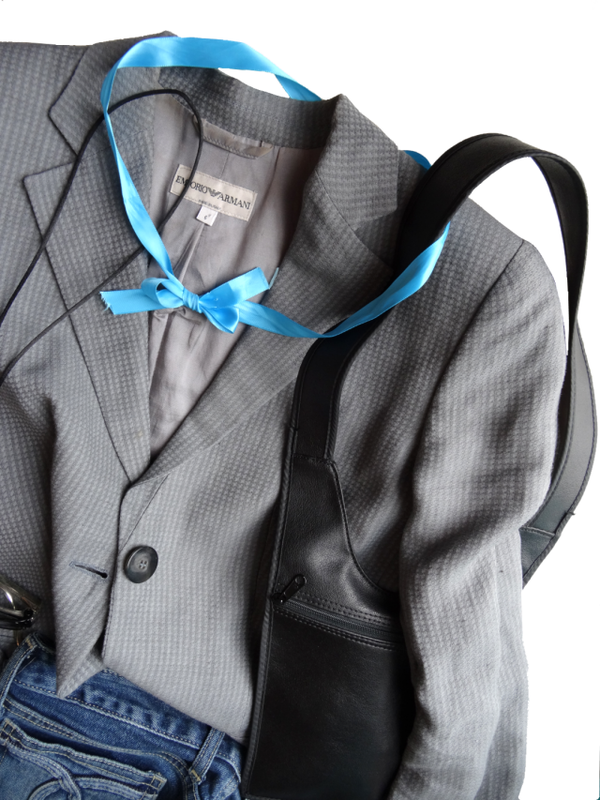 And I tied the strap around my neck with this feminine blue ribbon to secure it to my body. Without it, the pouch slides off, and wearing the pouch inside the jacket adds wretched bulk. Unacceptable! Plus, I adore this soft, colourful touch. You can see all the magic elements there. And below, the whole damned thing. I walked down the sidewalk like an outlaw in a Western, ready to draw. Yes, I mean it - I had paper and my special pen with me, which also added a soft touch. Carrying on with this dissection theme, we have my J.Lo workout jumpsuit in black velour. As if I'm going to work out ... Hahaha. I posted it on Instagram before, when it was oh-so-lonely, just plain 'ole black velour. But as you can see, the mystical melanization process has brought it to life, much like how Dr. Frankenstein reanimated bodies, except this cartoon doesn't have someone else's criminal brain, I'm pretty sure. See? This new, improved jumpsuit made me jump! Just a little. Just for a few ten-shot photo bursts. 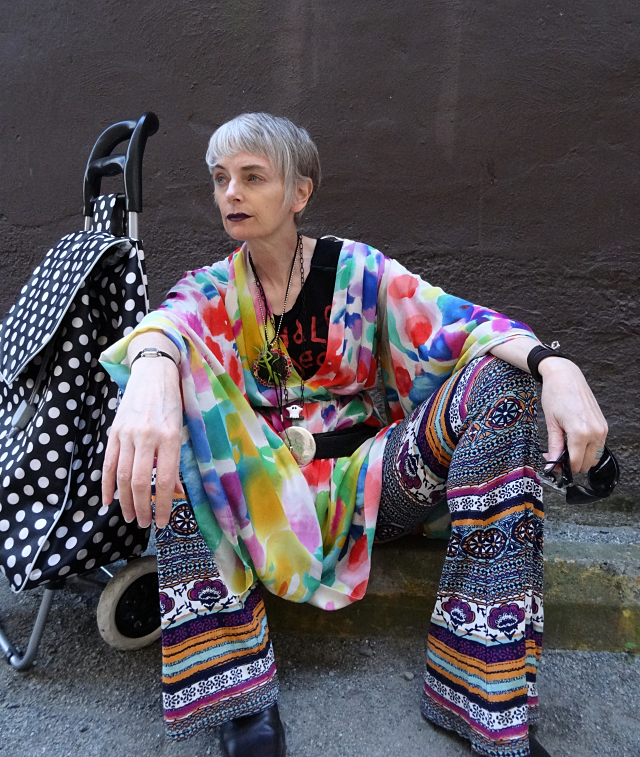 But I did some videoing in this outfit with my fabulous dotted cart, with lots of running and Flintstones twinkle-toeing, like here, well, as much as I could in platform runners. The men unloading the beer truck blocking the alley probably thought the lab switched the brains. The extra bits below. Humongous sunglasses, an absolute must, and my platform runners, which I bought in a moment of weakness (or strength of will?) super-duper sale retail. I loove these shoes. They scuff easily though. And of course, my magic ring is there and my magic loupe. See? 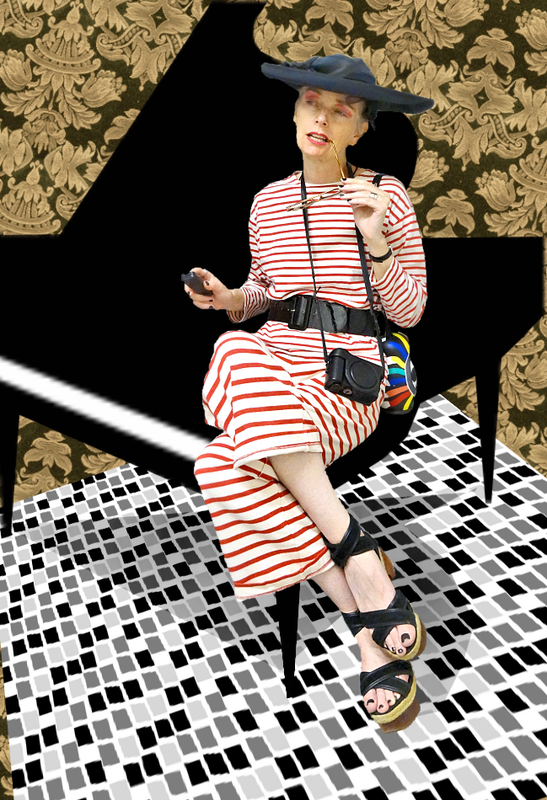 With these little style vignettes, this is just like a REAL style blog now. Pffft. Kiss my cartoon! And next, who do we have here? Why, this is Vivian! 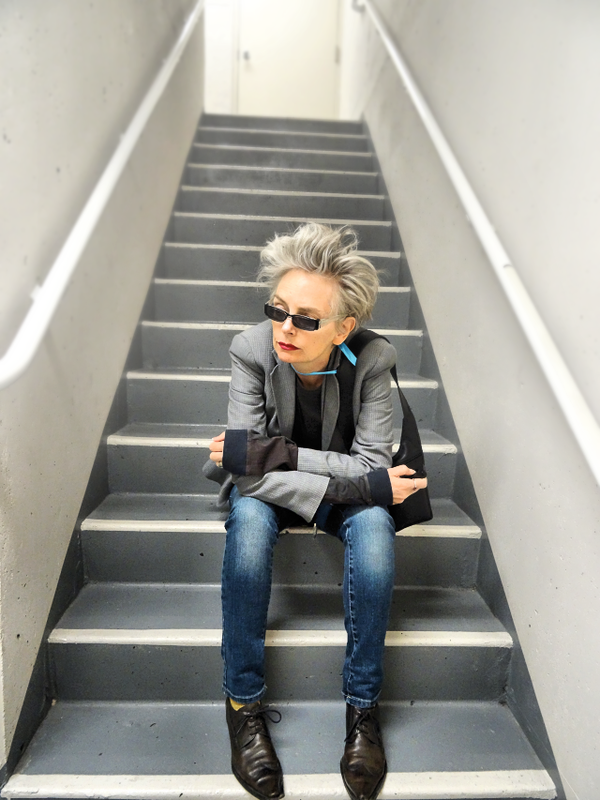 She was my personal styling/closet-rooting-around client. I had to share photos of her; we had such a good time. First, we went through her closet, and after, we went on a field trip to the store. It was a two-day thing. Below, the Before photo from shopping. 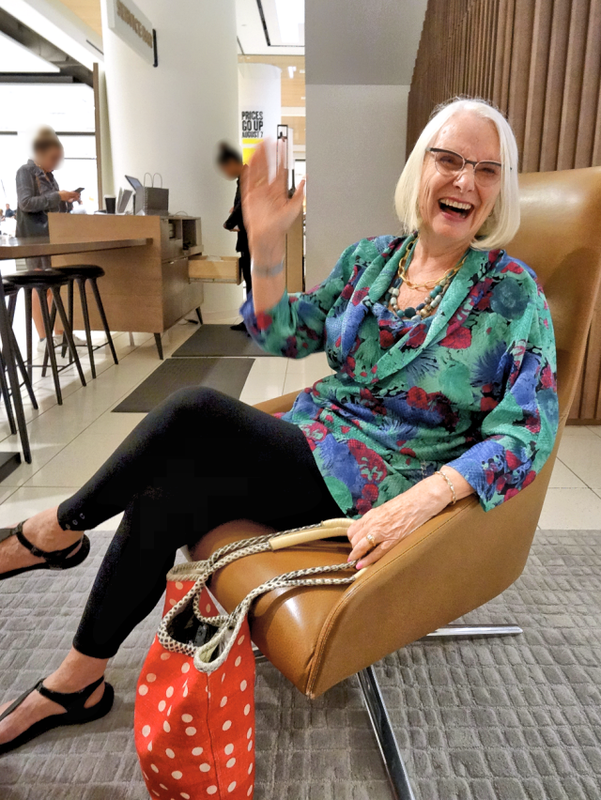 It's hard to believe we could "up" this starting point, but we certainly zigged and zagged and got her lots of new, fun, and lasting pieces for her wardrobe. You know how there is that popular style guide called Dressing Your Truth? Well, my version is more Dressing Your Dare. Vivian showed how it's done. Shoes! Scarves! Dresses! Coats! Bring it on!! Nah, she didn't buy the stole, we're waiting for the Bigger Sale. Hahaha! But she was game. And check out that lime green and burgundy wine designer dress behind her. Yes! No. She didn't get that either. The super-long pointy collar was impale-worthy. But it was a time of exploration, functional play I call it, taking stock and restocking. There are more photos of Vivian on her Instagram, HERE. I got permission from Vivian to post these photos, so don't go sweating all over yourself if you've gone all gaspy. Seriously, we had lots of fun and got lots done. If you're in the Vancouver area and feel ready for a little Frankening of your own, contact me through the email on this blog or via my Instagram. I haven't done it by video yet, but probably we could work something out. Maybe. That's all for this week, my little shoops, meese. (Goose, geese, right? That's how it's supposed to work.) Not that I think any of you are mutton! Or mooses! No! Okay, clearly, it's time to sign off for this week. Heh. 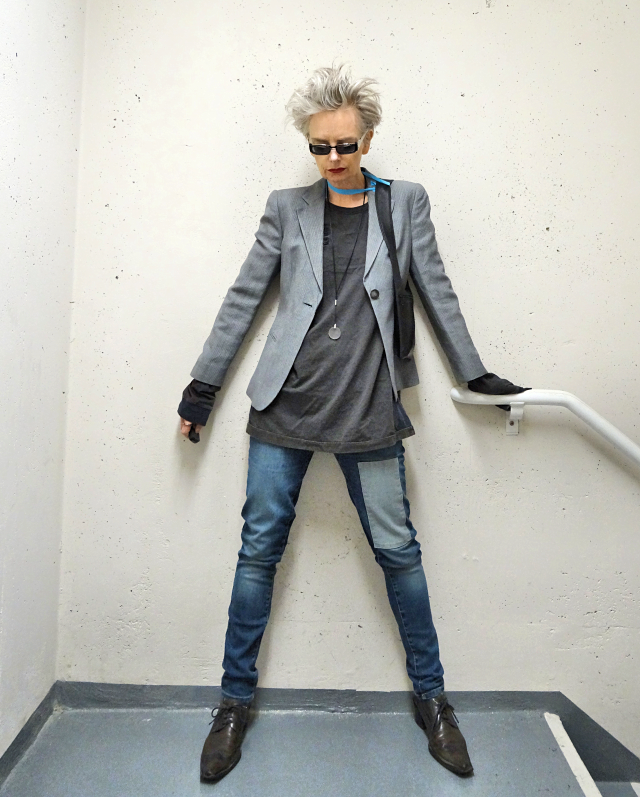 I'll link up to Patti at Not Dead Yet Style, Visible Monday. Yeah - refill the punch bowl, I'm bringing my Super Big Gulp cup! * And I'll link up to Catherine at Not Dressed as Lamb, #iwillwearwhatilike. Have a good one, everyone. You figure out what that "one" is. Have a good multiple. !!! Okay, it's really time to go. Thanks for visiting. My appreciation is unbounded. Too bad I ran out of cheese nippy hors d'oeuvres to feed you. *Super Big Gulp is the SUPER HUUUGE drink size you can buy at 7-Eleven convenience store, 1.3 L/44 US oz. Who? Who buys this size? There's even an X-treme Gulp - 1.56 L.
I can't hear me. The Big Interview. I painted my eyebrows white, well, very light blue, before I went out in the morning, and in this photo, taken when I got home, you can't even tell. So what happened to my makeup? Was it sucked into my body?! It's a pancake type from MAC, which means it's not tested on animals, a plus, unless you count myself. At least it washes off very easily, the part that your body hasn't lapped up already. My Big Interview was recorded a while ago for a podcast that went live a few days ago. The show is MaturePreneurial, hosted by Elaine Benoit. 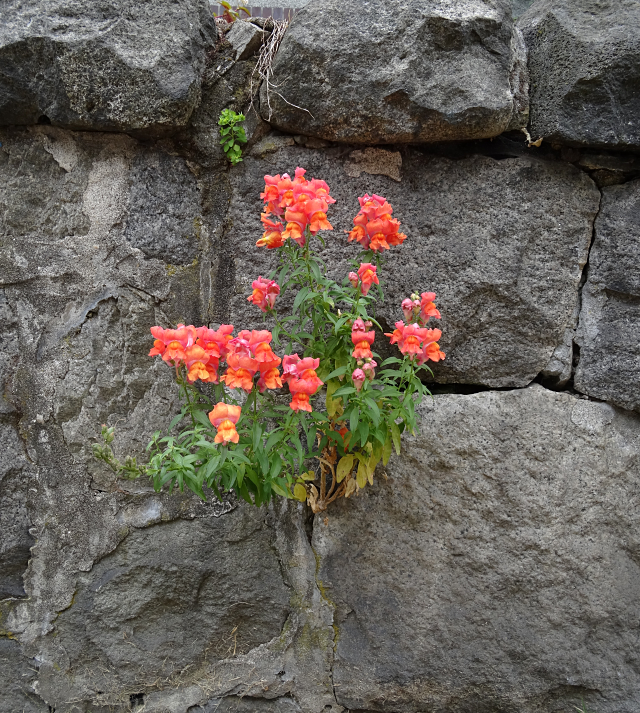 If you ask how it went, I would say it was kind of like snapdragons growing out of rocks, like these, which I photographed recently. I felt nervous but I pushed through it - I won't go so far as to say I bloomed madly, but I conquered another fear, and that's worth celebrating. I arrived at the sound recording booth early, having decided to use the pro studios at Vancouver Public Library's Innovation Lab. A Skype interview. The facilities are free with a library card - computer, mic, mixer. The tech promised to set me up, but when I couldn't hear my own voice through the headphones, only the interviewer's, the tech said, "It's supposed to be like that." ?! NOT. As a result, I was not only nervous but also flustered from the outset and didn't have a chance to review my notes. But I survived. Maybe it was better not to hear what I was saying. Heh. At least I could hear Elaine. When the interview was over, I noticed something weird. My pant legs had been hiked as high as they would go, and when you're wearing palazzo pants, which I was, that's pretty high. Yes, I had subconsciously been raising my pant legs throughout the interview, a nervous tick I suppose. Hahaha! Thank goodness I wasn't wearing a dress! - there was a tinted window in the booth where anyone could look in. So if you want to know more about me, have a listen HERE. Elaine has interviewed lots of interesting people, including Lyn Slater, who gave a detailed account of how her social media presence was born. The mysterious rising pants are in the bio photo there. A big thank you to Elaine for having me on her show! 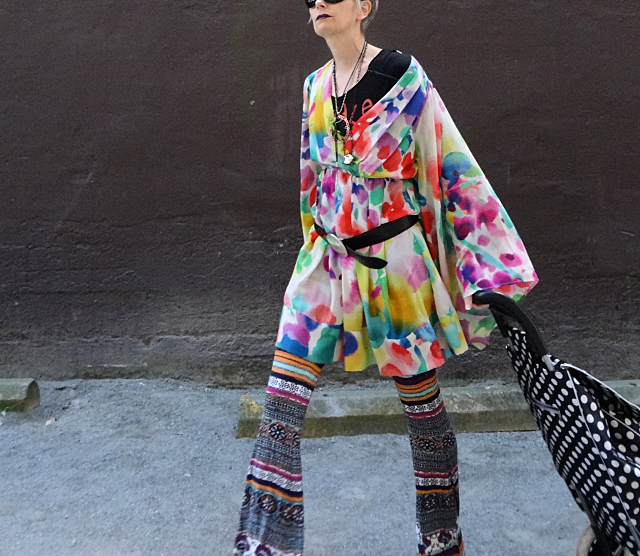 That's a Desigual T-shirt that Shelley of blog Forest City Fashionista gave me, with "RAINBOW" splashed across the front in sequins, and butterflies, so I farked it. Shelley suspected I would. Nobody tells me happy words and gits away with it! Heh. 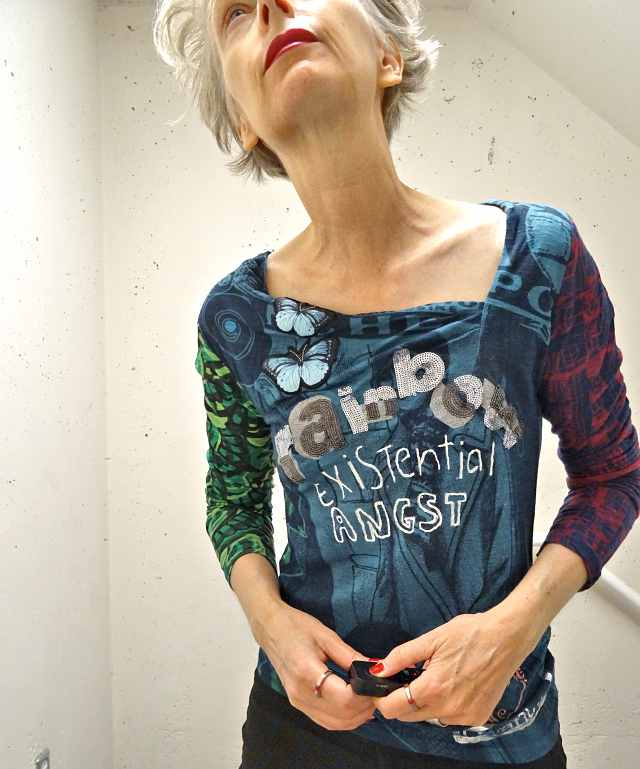 I added the phrase "Existential Angst" to balance things out a bit and wore it the first time with my tuxedo pants and a jacket I got from Sylvia of blog 40 Plus Style during the clothing swap at the big blogger meetup a couple of years ago. This outfit made me think of Tom Waits. And I'm wearing a couple of rings that O made me, also available in his Etsy store here. And I'm wearing BROWN. Whaaa?! It was nippy and this dress is a stretchy wool blend. 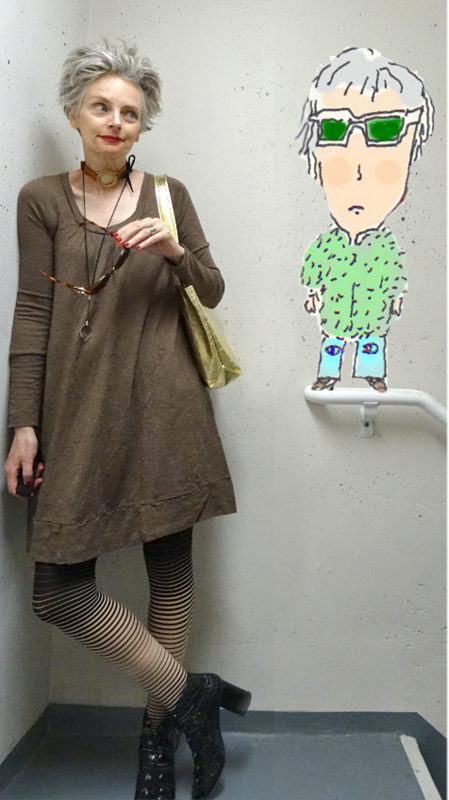 If I hadn't had the striped tights, I wouldn't have put it on. And I'm wearing my watch choker. It's easy to tell time because it's broken and time stands still. Of course you see my magic loupe too, also available in O's shop here, a handmade piece. He even shaves the lens to a custom size. I don't know what I'm doing in that pose down there. And one more outfit for the road. My huuuuge pants that will definitely fall down without my unisuspender or that chain belt I'm wearing. They are so cottony soft, double ply, by the Vancouver label Babs. And on top is my silk Donna Karan pyjama shirt. On my feet are my Velveteen Rabbit D&G shoes. Ahhhh, summer is here. I like it. Not too hot, not too cold. For now. That's all for this week. I had a whole post written and scrapped it at the last minute. I took time to write it too. That often happens when I think too much. Sigh. In my last post I wrote how I just got a cart. Pffft. I keep forgetting to take it out, or don't take it out on purpose thinking, oh, I'm not going to buy anything this morning, and then what?! All-natural peanut butter, $3 off per jar?!! Heh. Must. take. cart. And fan. 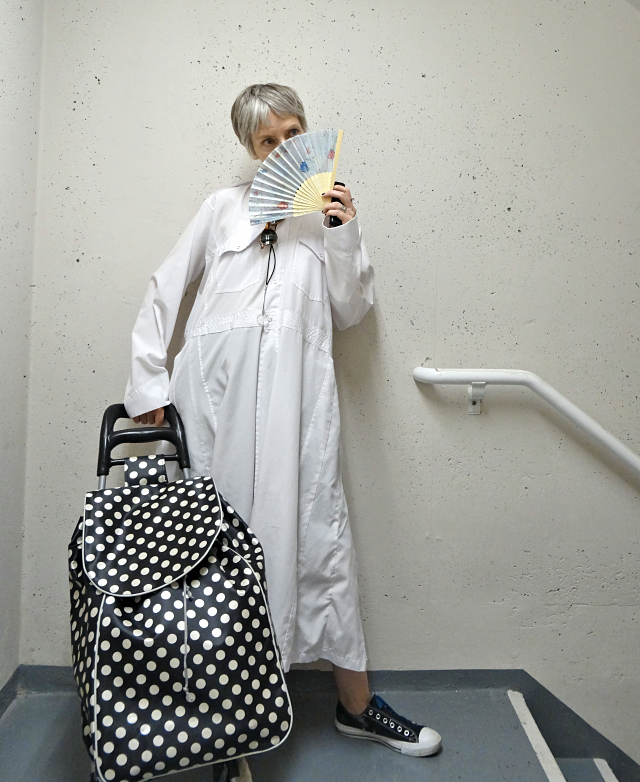 I'll link up to Patti's Visible Monday at Not Dead Yet Style and Catherine's #iwillwearwhatilike at Not Dressed as Lamb. I hope youse guys are in your groove, making the most of each day. As always, thanks for dropping by!! 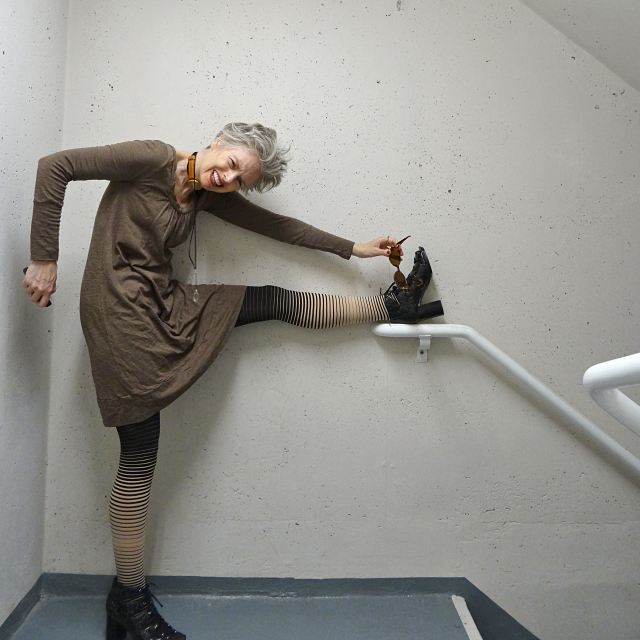 Had I not removed the background from that photo you would see that I'm running smack into the wall of my concrete box studio. Yesh. Tra-la-la. A grand escape from reality. But why? Please refer to Exhibit A, below. Woman with Cart and Fan. It's come to this. No matter how fast my trot, there is no avoiding the cart and the fan ⇽ Read that like a narrator in a horror flick and insert scream HERE. I had been putting off the cart for some time now, lugging home my groceries every day with only frigging enviro-friendly bags with handles that keep frigging falling off. It's what happens when you turn into a cheap beast of burden with a conscience and pretty, ill-made enviro-friendly bags. 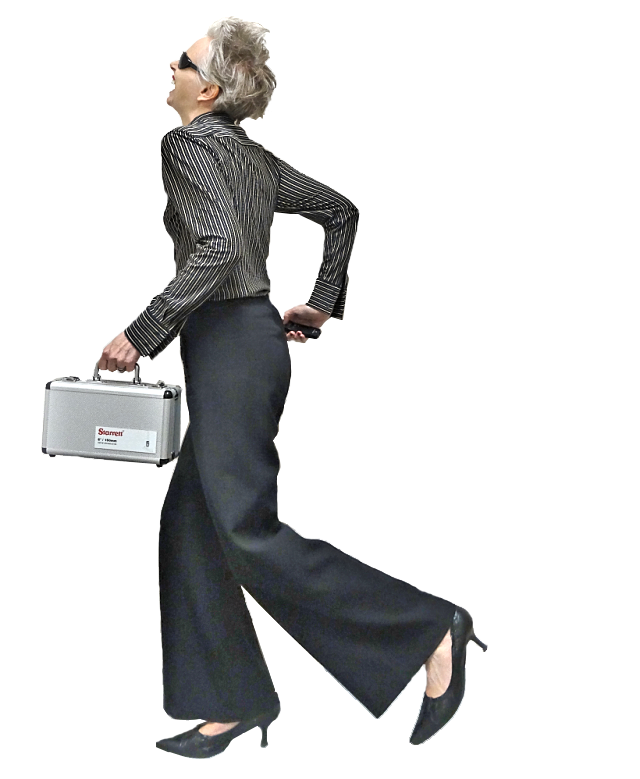 Then, last week, I saw a woman around my age at the library with a gosh-darn swell cart. I approached her and said, "Oh, I love your cart. Where'd you get it?" She looked up surprised and laughed. She said her mother had given it to her as a gift and she wasn't sure at the time whether to be happy or cry. "I'm too young for a cart!" was her thought. We both had a good laugh about that one. Now that she had a nice cart, with brilliant images of fruits and vegetables all over it (she likes to cook), her daughter in her 20s is always swiping it. Soon we'll all be [scary music] dum dum dum CART PEOPLE! Which reminds me, there's a great Japanese horror flick from 1963 called Attack of the MUSHROOM PEOPLE. Matango is the Japanese title. Great movie. A claaassic. You can watch it here, English version, at least for now. My sailor-style Sanchez pants, so-named because it is embroidered on the waistband. Emboldened by my encounter and facing a big food expedition, the next day I went into two discount stores to check out their cart selection. It was now or never. In the end I decided on this cart with white-dotted black vinyl, one of only three or so designs to choose from. And white wobblish wheels. As consolation, I got the best deal. AND I grabbed a fan while I was in there too. Puh, I thought when I got home, you call this a fan!? Looks like I'll need to add extensions about, say, a foot long now that my summers come from within, which is the most poetic way of putting it. Woman with Cart and Fan. Dress from TALIZE thrift store in Delta, BC. Converse runners. 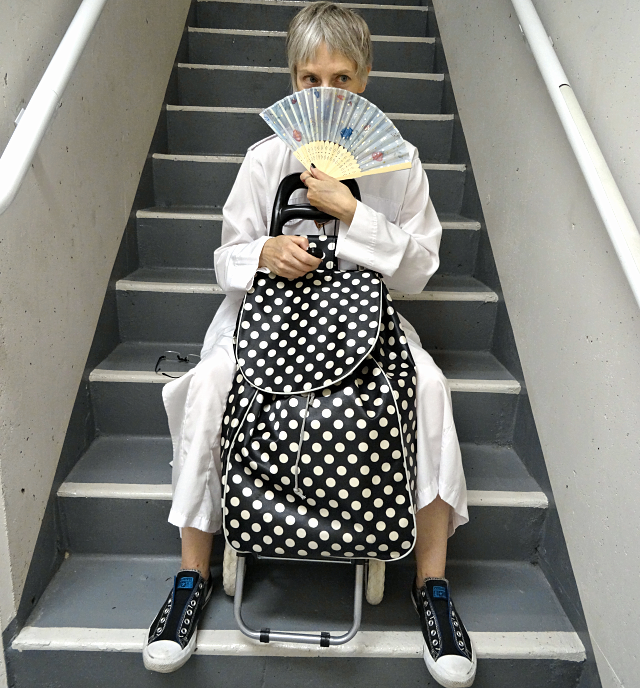 I was mighty pleased with my new cart and fan, thinking how relaxed my stroll home from shopping would be this time. I started mentally listing all the heavy things I could buy to celebrate - pickles, water balloons, paving stones. Passersby were smiling at me. Yes, I believe they wanted carts too! Only a cart could create such a joyful expression on my face. Or maybe they wanted to dress up like nursies in oversized white dresses like mine. This dress is identical to my traffic cone dress I posted on recently, both from TALIZE in Delta. Score!! This last photo is a psychological portrait. CART. FAN. mel. But not in a bad way. I was worried that my cart may affect my bad assery. Au contraire, friends. Now I can head over the hill with a Mona Lisa smile and nobody will know what hit them - my cart of course, careening wildly behind me. And the fan, it will keep me oh so cool, baybee. Clearly, I'll need to fark this cart and I have some ideas. And the fan too. Sheila of Ephemera has decorated several fans with wonderful Zentangle drawings using felt pens and watercolour pencils, here. My fan is a plasticy blue fabric purchased in an emergency, but I know I can find a plain one. I'm excited. LOVE IT, my awesome T-shirt by Suzanne Carillo. The best! 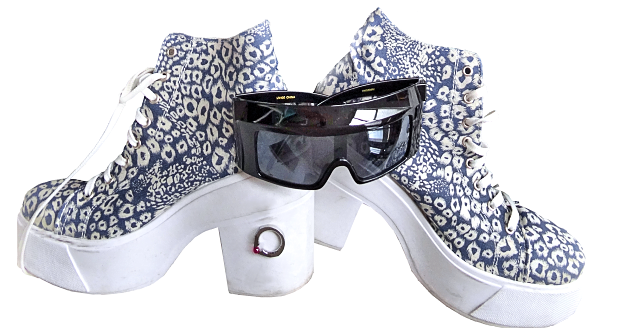 Worn with my men's Calvin Klein flowy robe, Dolce & Gabbana shoes, and vintage sunglasses. And of course my loupe by O - you can get one now too on his Etsy shop HERE. There have also been some stellar meetups this week - Deb, Barb, Judith, and hi! to Sandra, whom I met at Vancouver Art Gallery yesterday. I'll link up to Patti at Not Dead Yet Style for her ever-popular Visible Monday, and Catherine at Not Dressed as Lamb for her wonderful #iwillwearwhatilike, in this case, I will wheel what I like. How about you? Are you a cart person? I had one when I was in uni for my massive laundry hauls; I never envisioned the day would come I need it for groceries! Canada Day needed me downtown ASAP so I sprang into action. Red! Red! I must have red, the colours of our flag. Swoosh swoosh swoosh - I ploughed my way through the closet. Nuthin'. So I went to the other closet. Swoosh swoosh swoosh. Zilch. So I went to another closet - no hangers in this one. And aaaa (sound of angels), there it was. My soft, quality-cotton, red-and-white "pyjama" set, well, it was sold as a pyjama set even though each piece is by a different label. I think it could easily be leisure wear or, yes, Canada-Day wear. I carefully applied red and silver glitter eyeshadow under my brows, on account of the flag issue, and towered up my hair. Then, when I was about to put on my Converse sneakers I remembered I should bring a scarf to protect my neck from the sun. Back to the closet. Rummage rummage. And RRRrrrr! (sound of hard brakes) What's this?! My vintage hat, my long-lost vintage hat. At the Orient Express station. "Porter, oh porter, can you please take my bags? But leave the phone. I need to call my manicurist and Jean-Jacques, captain of my gorgeous yacht." Tower hair be damned. You're goin' down! And on went the hat. And be gone, sneakers! Quickly I strapped on my geta-style sandals and wide black belt, then the crown, this majestic chapeau. Thankfully, there were not high winds today - this hat's perch is rather precarious. There is a small elastic to help with hold though. And the finishing touch was this wonderful teacup carrier I made a few years ago from a wooden matryoshka. O created custom brass hardware to twist the top securely onto the bottom, and for the inside I sewed a satiny red pouch to cushion my family heirloom teacup. Sometimes I use this carrier as a handbag. A generous smudge of sunscreen on my nose, vintage sunglasses, camera. Done! Hmm, shall I buy the paisley Dior gown or the black vinyl Chanel hot pants? Everything is so complicated. "Please, garçon, can you bring me another Russian mule?" Frankly, I had more fun getting ready to go out than actually going out. It was so crowded and hot at the main area of festivities that I was forced to shuffle. Shuffle?!! In a divine hat?! And my wondrous pyjama set? Don't be preposterous! I made a 10 sec video on how I do my tower hair. Skip it if you've seen it on Instagram. It's the same one. This was not sponsored, pffft. 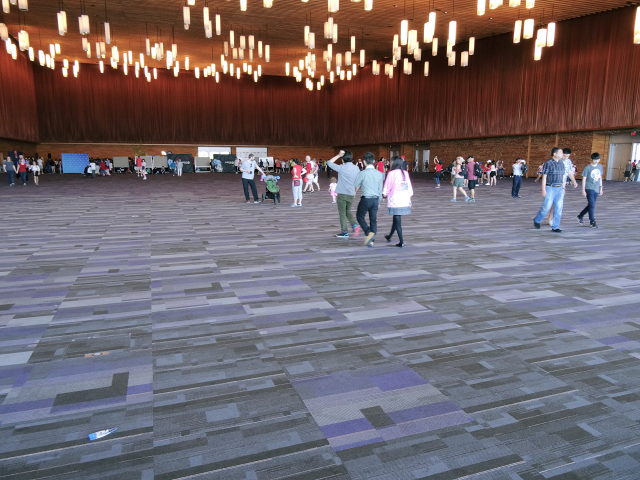 One good thing was that Vancouver Convention Centre was open to the public. I could live in that room, except for the vacuuming and changing light bulbs problem. This is the biggest ballroom in the place with stunning views across Burrard Inlet to North Vancouver. And below, a little more drama. Because it's fun. Canada is 150 years old now as a country. That's not very old. And the US has its big Independence Day coming up on July 4, so the city is still hoppin' with revellers. Me? I'm just workin' and readin' (fiction, The Woman on the Orient Express, great cover) and sketchin' - and planning, always planning. And I met up with Vancouver Barbara this week too. See her on IG. That's all. I have other photos but, really, you have been so patient with my overloaded posts lately I thought you deserve a break. I sometimes post outfit photos on my Instagram, ones that I can't fit into a blog post. If you're interested you can have a peek HERE. 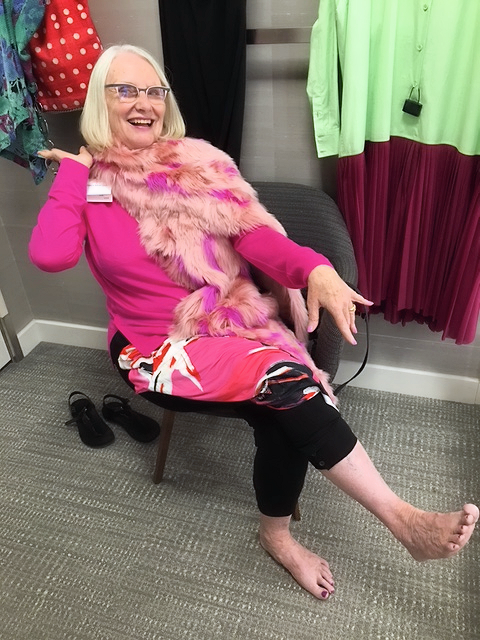 I'll link up to Patti and Catherine again, at Visible Monday, Not Dead Yet Style, and #iwillwearwhatilike, Not Dressed as Lamb. AND I'm happy to be joining Judith at Style Crone for her Hat Attack #48. FINALLY, I'm wearing a hat. Cheers! This post has been brought to you by the mischievous, often missing, letter G at the end of "ing." Thanks for stoppin' by! Where have your clothes taken you recently? Edit: I almost totally forgot. 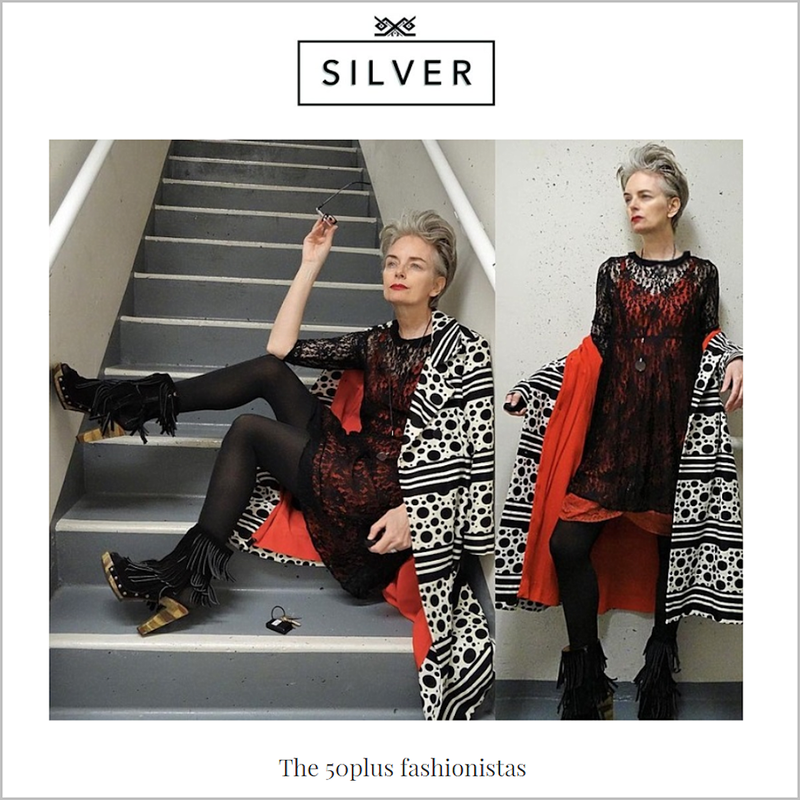 I am in Silver Magazine, based in the U.K., an article called "The 50plus fashionistas." They put a huge photo of me with the headline. Heh. I look so serious but only because I am an extremely serious person. See it HERE. That's all. I swear. I tried to keep this post short but look what I've done. I just keep dribbling.